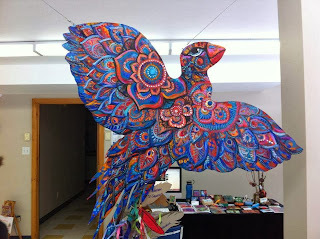 I thought I'd share photos of the beautiful hand painted bird soaring at the Canadian gallery this past weekend. If you'd like to host this bird in your gallery nest, be sure to contact the organizer Yanik Falardeau Avoxtar. 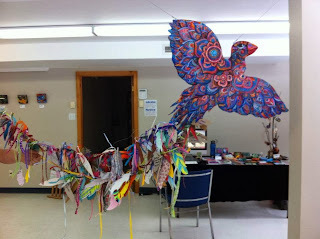 The bird has 513 mixed media tail feathers contributed from artists around the world. Congratulations to Yanik for putting this collaboration together!! I'm thrilled to be a part of this collaboration!